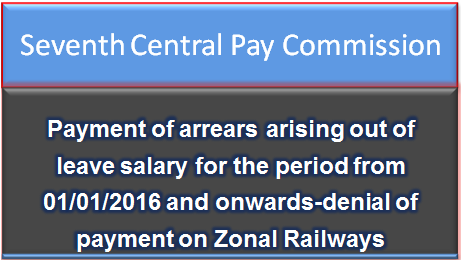 Sub: Payment of arrears arising out of leave salary consequent to the implementation of the report of 7th CPC for the period from 01/01/2016 and onwards-denial of payment on Zonal Railways-reg. In this connection, Federation also invites kind attention of the Railway Board letter No. E(P&A)II-2016/FE.2/5 dated 16/10/2017 (RBE No. 148/2017) wherein instructions were issued for reckoning of 30% pay element for calculation of leave salary on 6th CPC pay, to the Running Staff during the period 01/01/2006 to 31/08/2008 on raising the issue by NFIR through PNM agenda item No.57/2016 at the level of Railway Board. Unfortunately, similar instructions have not been issued for payment of leave salary taking into account 30% of pay element to the Running Staff consequent to implementation of the recommendations of 7th CPC w.e.f. 01/01/2016 with the result running staff are not being paid leave salary on Zonal Railways reckoning 30% pay element on 7th CPC Pay in the absence of Board’s instructions. Payment of arrears arising out of leave salary consequent to the implementation of the report of 7th CPC for the period from 01/01/2016 and onwards-denial of payment on Zonal Railways-reg.